The issue opens and continues with a narration of mostly Scott telling Barda a Christmas story while the visuals are of a blurred out Orion taking care of Granny Godness' body...especially her head. The story is about the atrocities of war and possibly how it's not just the war itself that can wipe out a population. I say possibly because again, it kind of is all up in the air for now. We then get a terrified looking Scott who isn't able to sleep and the mention of the Paranoid Pill and Dr. Bedlam. If you know your history, this is a solid clue as to what is going on here. Seeing Scott take his pills right after might just seal the deal. 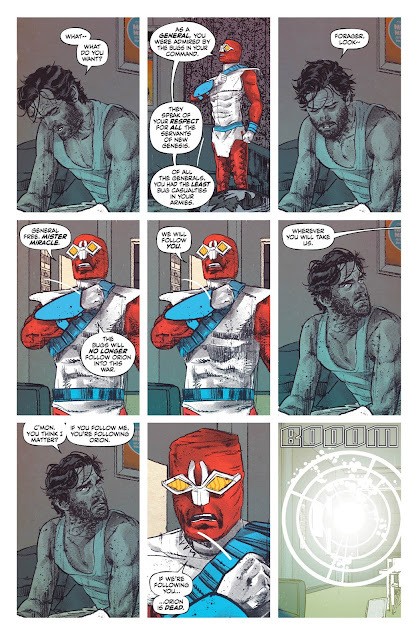 Right after, Forager arrives to plead his case to Scott about wanting to follow Mister Miracle into battle, not Orion. 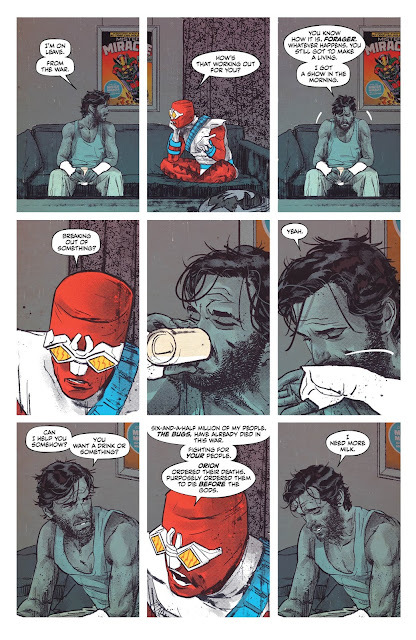 It does look like Mister Miracle is a milk carton missing person in the scene and hearing Forager mention that Scott is "breaking out of something" caught my attention as well. Then Lightray shows up and straight up disintegrates the Bug. Up until this point, I have to admit that I was really enjoying myself. That's when Tom King gives us the "Darkseid is..." line and has Scott say he thinks it doesn't mean anything and people say it to be cool. Okay, you may not think this should have any bearing on this series, but having the whole difference between a joke and a riddle boiled down to "who cares" just a week ago actually made me very angry about this Darkseid is... bit. Very angry! We then get an extended look at Miracle's escape and the best part of the book. Scott and Barda are eating at a sidewalk cafe, talking about Orion invading Apokolips and how Scott isn't well. I don't trust Barda here at all! We end the issue with the start of another performance that turns into a meeting of Scott and Orion. Scott drops a major bombshell and Orion beats the crap out of him. It all ties into the "Face of God" bit that Metron warned him about and we may just see why that warning meant so much. This is my favorite issue of the series so far and it's not because we get answers, but because the mystery is now very interesting. 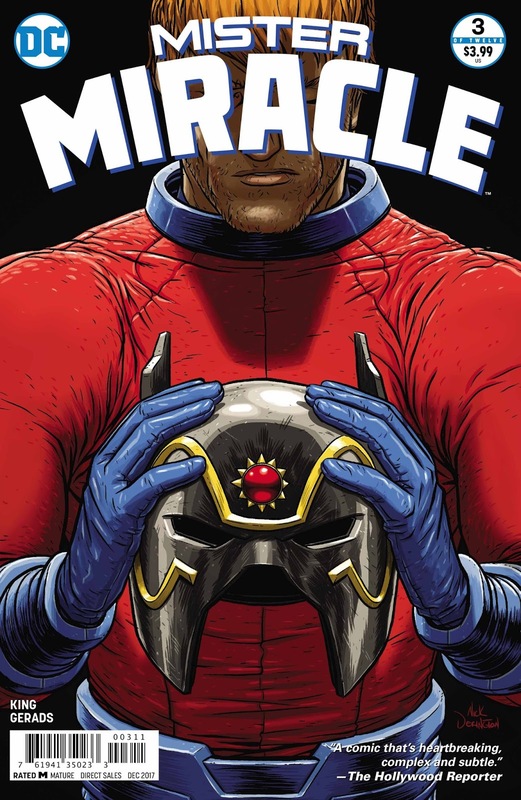 I still think it's hard to review this series on a issue to issue basis, but if it continues down this path, I will be very happy. While I hate the blurred out pages that seem to dominate this series, I realize there is more than meets the eye there. Still, I don't like looking at them and when Mitch Gerads gives the readers more standard art, I love it. 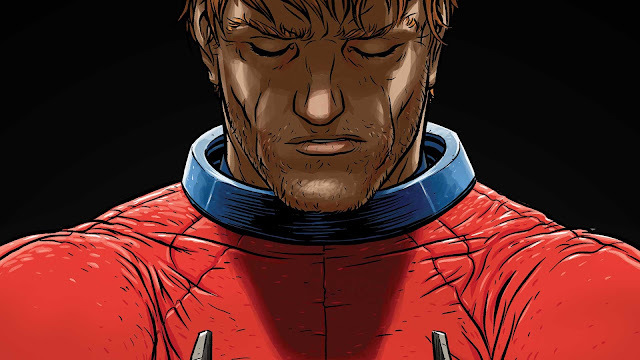 The art has never been a problem in this series and this issue is no exception. 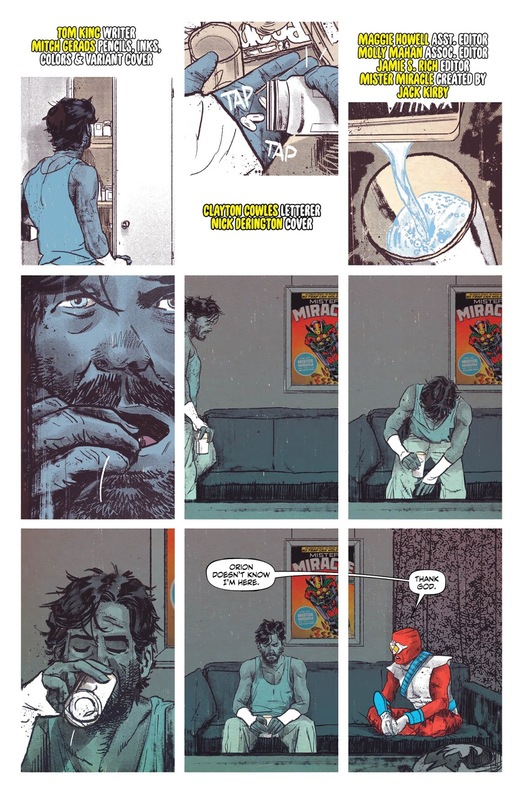 While it seems that Tom King still wants to keep his cards close to the chest, this issue was interesting enough to get me back onboard the series. Mitch Gerads great art helped matters and I am now back on the Mister Miracle trolley. I just hope I can stay on for the remainder of the journey.